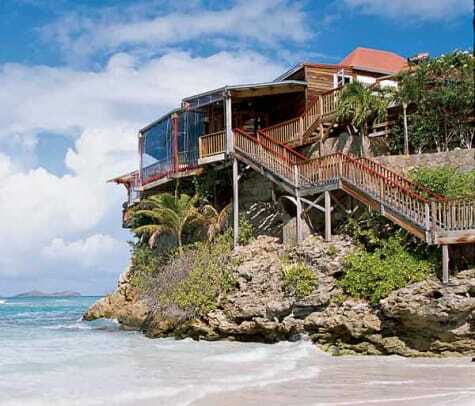 Gustavia Harbour on St. Barts is to yacht charter what The Late Show With David Letterman is to celebrities. There are only so many places to park yourself in front of the audience, and there are precious few chances to get one of those seats—or shall I say slips—on a given night. Anyone yearning to be seen dreads being left in the wings. If you&apos;re not good enough to get in, then you might as well stay home. 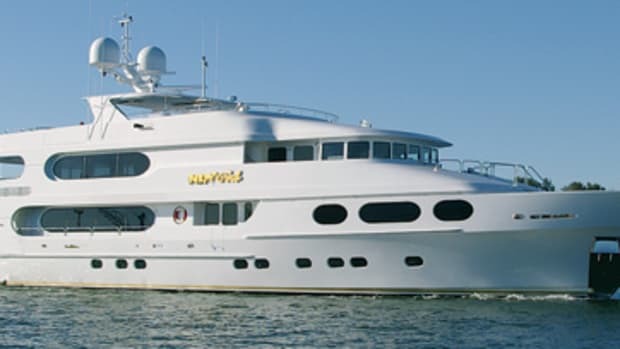 Sherakhan&apos;s owner took what he learned as an owner-operator of a "regular-size" motoryacht and then upsized so he could accommodate more charter guests at one time. That is, of course, except for the occasional mega-celebrity—say a George Clooney or a Julia Roberts. They intentionally limit their exposure, often watching contentedly from afar. They are, quite simply, bigger than the show. This is how I feel as the 228-foot Sherakhan carries me into Gustavia Harbour. 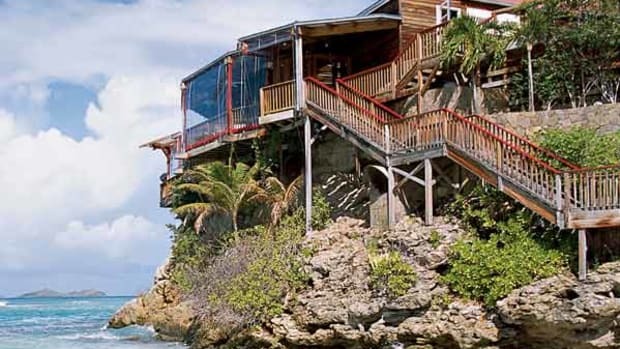 We don&apos;t have a reservation for one of those coveted slips on the St. Barts quay, but that&apos;s not because we don&apos;t belong. It&apos;s because we&apos;re too big—one of the biggest charter yachts in the world, in fact. As we drop anchor for the night, we move the show. We are the show. Forget the 120-footers lined up side by side, waiting to be noticed. Even their crews are looking past each other, craning their necks for a glimpse at us out in the harbor. Inside Sherakhan, to tell you the truth, we charter guests couldn&apos;t have been caught at a less-glamorous moment. We had just finished breakfast (our daily Volkswagen-size buffet of everything from fresh crepes to smoked salmon) and were all dashing back to our cabins for pit stops before heading ashore to explore the best that St. Barts has to offer. The day&apos;s itinerary would include shopping, sightseeing, and lunch at the Eden Rock on St. Jean Beach, where world-renowned chef Jean-Claude Dufour has been delighting the planet&apos;s wealthiest patrons since the late 1990&apos;s.
My terrine of grilled vegetables and goat cheese was good that day, and even better was my five-course dinner later in the week on Anguilla at Brad Pitt&apos;s favorite Caribbean hangout, Altamer. But, to tell you the truth, I would have been happy to eat every meal aboard Sherakhan instead of taking the tender ashore at all. The yacht is just that comfortable and impressive—as well she should be, given her half-million-dollar-a-week price tag. Whether you want to have all eyes on you or hide away from the crowds, Sherakhan is built to please. She is the work of a man named Jan Verkerk, whom I first met some years earlier. I remember sitting with him in the skylounge onboard his previous owner-operated yacht, the 124-foot Jaguar, looking out at the cityscape of Genoa, Italy, as he excitedly explained how he saw a hole in the charter market for what would become today&apos;s gigayachts: super-size boats built to international construction standards so that they can take more than 12 charter guests while still offering yacht-level service and appointments. He realized his vision by evolving into an owner-operator on a scale that dwarfs most boaters&apos; imaginations. He&apos;s not Sherakhan&apos;s captain, but he does live and work among the crew, and since it&apos;s his name on the bank papers, he&apos;s obviously the man in charge. He lives and breathes this small ship the way other owners would a 40-foot Sea Ray. He fixes loose screws. He takes his turn on anchor watches. And he shifts into the role of dinner host during charters, if guests are interested in learning the history of the yacht. I imagine the conversations go much as the one did the night he dined with our group in Sherakhan&apos;s stunning, two-story dining room. Several of the guests complimented him on just how beautifully Sherakhan had turned out, citing things like plush carpeting and curved glass accents. "What you&apos;re seeing," Verkerk delicately answered, "is the last five percent of the boat, the interior. Ninety-five percent of the boat took three years of my life." She started out as Princess Margaret, a hulk of an abandoned commercial ship destined to rot in Holland. 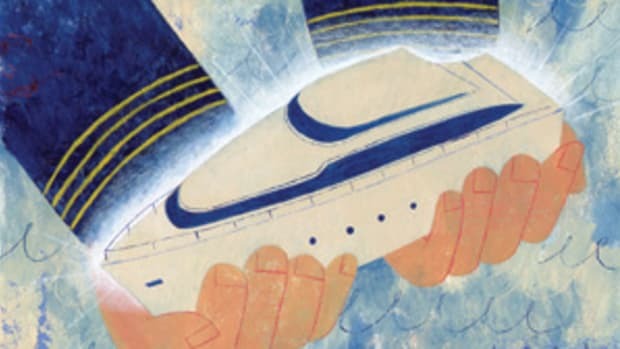 "I&apos;d seen [her] many times before," Verkerk recalls, "and I said, &apos;Oh, that&apos;s a lot of work.&apos;" She looked better to him after September 11, 2001, when the worldwide charter industry suffered a downturn and his income aboard Jaguar no longer supported his custom-construction dream. His four-year-old daughter christened the rebuild Sherakhan, after a character in Disney&apos;s The Jungle Book. The tiger-inspired Sherakhan logo now graces the main guest foyer, near a portrait of her namesake, Princess Margaret, a reminder of the yacht&apos;s past as well as her current, stately air. What a striking woman the princess was, and how fitting, perhaps, that her portrait is located near the stairs that lead to Sherakhan&apos;s beauty salon. I&apos;m not typically one to visit such places onboard a boat, or to think that they belong onboard boats at all. But I admit, after my time aboard Sherakhan, I do appreciate what it means for a yacht to be able to offer virtually everything a guest might desire, all in complete privacy. And that, for those traveling in the same circles as Clooney and Pitt, most definitely includes pedicures. It also includes more memorable extravagances, things like beach barbecues organized by a half-dozen crew members to include not just a long table with chairs on a private stretch of sand, but also chaises for lounging with champagne while snacking on hors d&apos;oeuvres. Sherakhan&apos;s crew arranged this for our group one day on Prickly Pear Island, going so far as to hail Verkerk himself to bring more bubbly by tender when our initial cooler ran dry. He delivered it with a smile as the yacht&apos;s sous chef kept the grill going and the stewardesses laid out countless salads. We stayed until the sun dipped down and, I think, would have gladly stayed forever. The place was all ours. That&apos;s not to say it&apos;s hard going back to Sherakhan at the end of any given day. Her sheer size affords incredible interior volume, and that includes the guest cabins. I was in one of the smallest, with twin beds, and my bathroom was bigger than an entire cabin on some 40-footers. My clothes barely filled one-quarter of my closet. I might have felt Lilliputian if not for the fact that Sherakhan&apos;s size engenders the opposite sensation: being larger than life. The chaise lounges spread out on the Portuguese bridge, for instance, are a solid three stories above sea level. Every harbor we entered, every yacht we saw, we towered above. I can see how Julia Roberts might get used to life at this vantage point. It&apos;s true that from vision to execution, Sherakhan had me star-struck well before I even stepped onboard her vast decks. 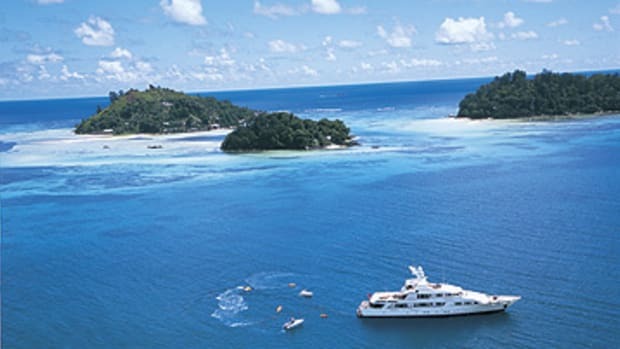 But in the end, it is the experience that must be outstanding for charter guests to come back at a weekly base rate of more than $500,000—and they do come back, reportedly nearly half of them, including one repeat client who booked a four-week-long charter. 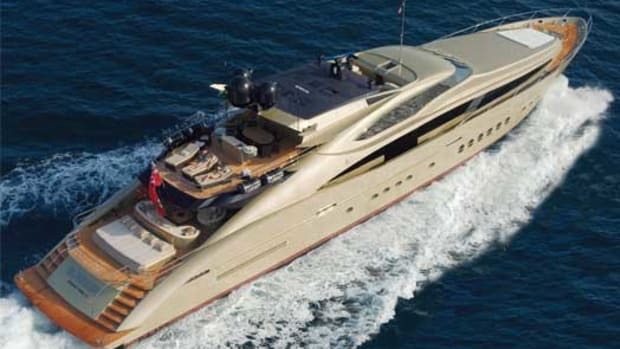 If I had to quibble with anything, it would be the yacht&apos;s lack of zero-speed stabilizers, which are now a given aboard charter yachts in this price range but which, I&apos;m told, would be ineffective onboard a yacht of Sherakhan&apos;s shape and draft. Though she is big and heavy, she pitched like all the other yachts in the six- to seven-foot swells we encountered. A few of the ocean&apos;s messier afternoons had us rolling good and hard. She is built to be one of the most impressive yachts in any destination, the kind of yacht where everyone is dying to get inside, if only to see who is there and what they are doing. What the guests are doing, though, is the same thing every other boater is doing. "Going to sea," as Verkerk says, "can be like one big yoga lesson. No calls, no e-mails, just books and rest and peace and quiet." And a staff of 18, a private library, a sauna, an on-demand masseuse—well, these things don&apos;t hurt. Maybe next time I&apos;m aboard, I&apos;ll try the indoor gym. After all, I need to keep my girlish figure in case any paparazzi come around. Sherakhan takes 26 guests at a weekly base rate of 380,000 euro. 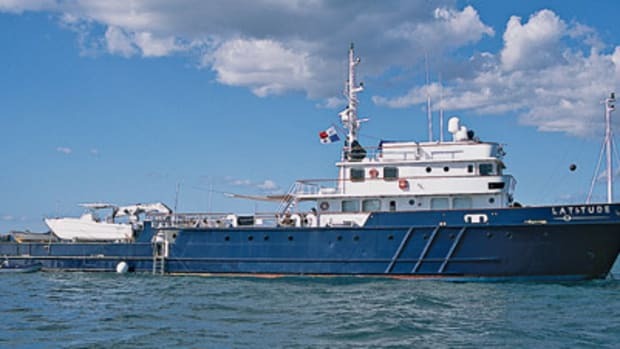 She typically charters in the Caribbean during winters and in the Mediterranean during summers, but she may be available in Southeast Asia during the winter of 2008-09.